Dark Shadows News Page: Dark Shadows a Franchise? "The Possibilities Are Limitless"
Dark Shadows a Franchise? "The Possibilities Are Limitless"
"It was something that affected me... when I was at that awkward age of 13, 14 and 15. I felt like I didn’t fit into the world, so this kind of weird vampire, this weird, out-of-place person, had an impact on me. Besides Johnny Depp, myself and Michelle Pfeiffer (Elizabeth Collins Stoddard), none of the rest of the cast knew what it was. I couldn’t really show it to them, because they’d just go, ‘What the hell is this?’ You had to be there to get the vibe of it." 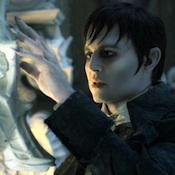 The director also outlined his unique approach to recreating the Dark Shadows atmosphere: “I never really considered it to be a vampire movie. It’s just a movie with a character in it that happens to be a vampire," Burton explains. "Studios don’t like to hear me say this, but it’s all a bit of an experiment... Is Dark Shadows a comedy? Is it a dark Gothic drama? Is it both? I’ve never thought about it in those terms. Because it’s more about trying to get a vibe right... in a weird, melodramatic, soap opera-y way. I’ve made something that I can’t quite categorise." Speaking about the storyline, Seth Grahame Smith emphasised the desire to make the situations identifiable: "Despite all the witches, ghosts and vampires, it’s a family drama and a story about a family that’s lost its way, and of Barnabas reminding them who they are. "Asked about the possibility of Dark Shadows spawning a movie franchise, Grahame-Smith is enthusiastic: "It's rooted in soap opera, and the supernatural. Without wanting to spoil anything, even if people pass away, they don’t pass away... with over 1,200 episodes to draw from, in terms of characters and plot lines, the possibilities are limitless." Does anyone know if there will be any extra scene after the end credits? It seems that Screenwriters John August and Seth Grahame-Smith have really boiled down the series to a great concept. Like many, I've probably seen Barnabas more as a tragic than heroic figure. But positioning him as one who reminds the family of who they are, is a grand, fundamental story arc. It shows that Burton et al have thoughtfully found a soulful thread among the supernatural goings-on in the fertile, gothic world of Dark Shadows. Though we haven't seen the film yet, this idea alone brings a slightly more focused view to the twisted history of the Collins family, even when the original series itself sometimes lost its way in the telling of their stories. Heck ya, I would love it if this became a series. We need a GOOD vampire series if you know what im getting at. I would love to see the second film be a haunting by Quentin and Barnabas's trip back to the 19th century. It would probably have to be 1872. They could go crazy with clothes. Joaquin Phoenix might make a good Quentin/werewolf, and I'd like to see Magda and Count Petofi. The third film could be The Leviathans, and Nicholas Blair. Any sequel would have to include Quentin. I wonder who would play him? He was probably the most complex DS character of all (due in no small part to David Selby's considerable acting talent). If there is going to be any sequals or a new version of the TV show, we ALL have to go to this movie the first weekend it comes out. Avengers comes out right after Dark Shadows and it will get buried under that movie. For DS to be a hit it has to do really well that first weekend. So forget your reservations and go see the film! Take you your frineds and family to see it. This is our chance to bring back Dark Shadows! I don't blame anybody for not being thrilled about The Leviathans in a second sequel, but remember, this would be so different. The Leviathans could be really hilarious, with the weird little boy, who keeps growing, every five minutes, the Todd's spooky antique shop, and the monster you never see. Some of the ideas that didn't work the best the first time, might come out very well. That's what excites me, the chance to improve certain things. It's also a way of bringing Nicholas Blair in. This would be the time for Angelique to come back, possibly as Casandra, and combine the big fight to the death between Nicholas and Angelique with the Leviathan story. This could also be when The Dream Curse happens. Quentin should come first, in the first sequel. I'd also like to see Laura, the Phoenix. I really hope they go back in time for Quentin, they could have a major field day, in the 19th century. They could also go back to 1922, and bring a mummy into Dark Shadows, for the first time. I agree with Steve - before we get carried away with sequels we have to make sure the first Dark Shadows does well. Common DS fans - get to the theaters on the first weekend and make this a success! Star Trek moved ahead with the idea for sequels, even though the First Film got the vibe all wrong (too serious, be careful what you wish for - sound familiar? ), and it took the humanity and the humor of the second film The Wrath of Khan to restore the Trek we all knew and loved. 4 new series and how many feature films later, it still is going strong. DARK SHADOWS has so many haunting secrets to unveil: it's rich-foundation storylines is on so many levels of the Supernatural and the many Classic characters unique!!! Quentin Collins (I lov' him...'his a smooth-sauve haunting Ghost) & Daphne, Rev. Trask (His as evil as Angelique), Yaeger/Jeb Hawks (Wow, scary..), Maggie, Prof. Stokes, Sarah, Chris Jennings (the wolf), Amy Jennings, Gerald, Eve, Beth the list of Classic DS's characters are quite extraodinary & it's Parellel storylines and COLLINWOOD's Mansion Home and The Collin's Family is rich & complex. Everlasting mystery-chills and yes, DARK SHADOWS can certainly be a Movie Franchise pearl,too. I look forward to sequels!!! Even if you don't LOVE the new DS movie, I think it behooves us to go see it multiple times and bring friends. I would be thrilled to see this break $300 million in the US.